Feeding a large group and craving Mexican food? We have the perfect solution! Fajitas! Mix and Match from our chicken, steak or vegetarian fajitas. For large order we include rice, beans, and tortillas as well as the guacamole, sour cream, salsa fresca, salad and our famous house dressing! 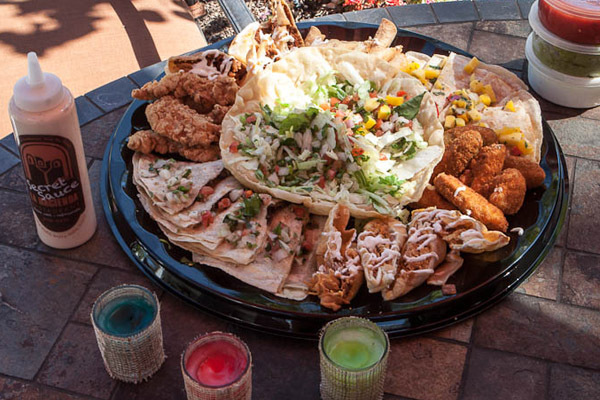 A great option for those party planners or Sunday football games is our party platters. We offer a Salad option that feeds 8 or the Sampler Platter that feeds 10! You are sure to be a hit with these massive trays! La Hacienda Restaurant © 2019 2635 Esplanade Chico California 95973 tel: (530) 893-8270 Design & Development by MC2 Design Group, Inc.